This makeup brush works wonders for me, a short, flat-topped brush ideal for creating a flawless finish for liquid foundations and cream blush. The bristles of the brush is dense which allows a greater control for buffing and blending into the skin which gives a less to non-streaking effect. This is also similar to the MAC 130 with a difference that the handle is shorter than the Mac one which is good for traveling. It's also cost efficient than the Mac 130, I bought mine for $26 cdn. 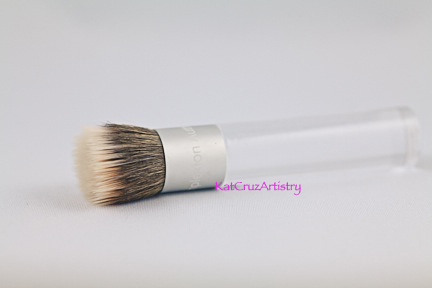 This is definitely a must have brush to add on to your collection or to your kit.